Sean P. Sullivan - Washington Wine Report: It doesn't take a rocket scientist to make great wine...but it doesn't hurt either. It doesn't take a rocket scientist to make great wine...but it doesn't hurt either. While a native of Spain, Alfonso has roots in the Wapato and Zillah areas of the Yakima Valley where ancestors on his mother’s side settled several generations ago. Moving to the United States in 1995 to attend school, Alfonso did not think much about the connection between wine and the land because this thinking is so inculcated in the culture of Spain. However, when he saw Washington emerging as a wine region Alfonso says, “developing this culture in such a ‘blessed’ region eventually became my obsession.” Like many winemakers in Washington, it is an obsession he has focused on nights and weekends after his day job. Unlike many though, he works as a rocket propulsion engineer (insert your rocket science joke here). In selecting vineyard sources, Alfonso looks for uniqueness. He seeks out areas where the vines tend to be older and “have had time to become entrenched within their surroundings.” The winery uses top vineyard sources for its wines including Dineen (Yakima Valley), DuBrul (Yakima Valley), Upland (Snipes Mountain), Konnowac (Yakima Valley), and Elerding (Yakima Valley). Many of the vines in these vineyards range in age from twenty to forty years old. Pomum Cellars’ wines show a balance of Old and New World styles. The 2008 Riesling comes from Upland Vineyard near Sunnyside, Washington. The vines for this offering approach forty years of age, and it seems to show on this beautifully balanced effort. The 2007 Red Blend, made from declassified barrels, is the most enjoyable $20 bottle of wine I have had in a long, long time, drinking like a wine at a considerably higher price point. The aroma and flavor profile is quite unique for Washington with alluring black tea notes. While not built for the long haul, the wine is too enjoyable to hold on for long anyway. The Syrah on the other hand is a dark and brooding wine that promises to mature nicely with a few extra years in the bottle. The 2007 Tinto – very enjoyable but the weakest of the current releases - is a blend of Tempranillo, Cabernet Sauvignon, and Merlot. Still, this wine shows the promise of Tempranillo in Washington. While Washington is a young wine region compared to his native Spain, Alfonso is excited by what he sees here. “The soil and the climate constitute some of the best conditions for growing vinifera vines I have seen anywhere in the world,” he says. Alfonso is particularly excited about the possibilities for Spanish varieties in Washington, such as Garnacha, Tempranillo, and Monastrel. 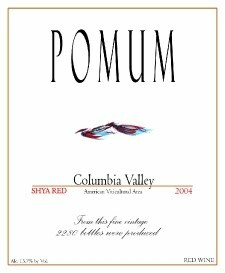 Pomum Cellars produces 2,000 cases annually. Rating: * (Excellent) Light floral aromas along with tangerine mark a nose that is a bit quiet at the moment. Dry and beautifully balanced on the palate with a lingering, mineral-laden finish. 100% Riesling, Upland Vineyard (Snipes Mountain). Fermented and aged in stainless steel. 12.5% alcohol. 0.8% Residual Sugar. 125 cases produced. Rating: * (Excellent) Black cherry, a dusting of black tea, mocha powder, earth, and light herbal streaks on a gorgeous, engaging nose. Intense and loaded with fresh cherry and cranberries on the palate while still showing incredible lightness. Opens up in series of concentric rings before making a giant exclamation point on the finish. An outrageously high Quality-to-Price ratio wine. 65% Cabernet Sauvignon, 21% Merlot, 14% Cabernet Franc. 14.3% alcohol. 140 cases produced. Rating: * (Excellent) Dark and purply in color. An appealing, understated nose with ground spices, stone, bittersweet chocolate, a light earthiness, herbal streaks, and brambly fruit. On the palate, round and firm with a tight core of black fruit and a pleasing citric uptick toward the finish. Opens up and evolves over time and promises to mature well in the bottle. More Old World in style than most being made in Washington. 100% Syrah. Upland (Snipes Mountain) and Elerding (Horse Heaven Hills) vineyards. Aged in used 225 liter French (77%) and 500 new liter (23%) French oak. 14.9% alcohol. 215 cases produced. Give one year or decant. Rating: +/* (Good/Excellent) Nose is fairly locked up at the moment, although it shows dark fruit, mineral notes, light chocolate, and floral aromas. The palate, on the other hand, packs a wallop. Dry, tart, and beautifully structured. Quite tight at present but shows promise. 72% Tempranillo (Snipes Canyon Ranch, Elerding), 16% Cabernet Sauvignon (Upland Estate), and 12% Merlot (DuBrul). Aged in once used French Oak barrels for 14 months. 14.3% alcohol. 197 cases produced. Red Wine and Syrah provided as samples. Riesling and Tinto from purchased samples. Josh, very good question. He should know better! Thanks for the comment. All joking aside, why is it such a big deal for someone to start a business in an area that they like, have skill, or have a passion for? It seems like I see a lot of comments in blogs, writings, funny-videos, etc. on how *crazy* someone has to be to start a wine business. But if this were a hot-rod blog and the reviewed person operated a shop to work on vintage hot-rods, would the same type of joking comment be made? I think that we would be saying comments like, “yeah, I love this guy’s work” or “I got work done on my hot-rod, and for the price, he did a good job” or whatever. I would not think anyone is crazy or question their reason for getting into the beer business, jewelry, car sales, coffee stand, restaurant, etc. It gives us consumer’s variety, choice, and enriches our life by being able to socialize, critique, and write about their offerings. If there were only three [enter favorite business here], then [enter favorite business here] blogs/magazines/life would be quite dull. Uggh..I forgot. Good post Sean, I love this winery name and great story. Hi Micah, nice to see your comment! All joking aside, I love seeing people follow their passions whether it is wine or whatever. The world is full of a lot of people doing things that they don't give a damn about which makes the world...a less happy place. Always like to see people following their dreams. Now if they think they are going to get rich doing it (Note: I can't think of anyone I know who got in to wine as a 'get rich quick' scheme), THEN they are a little bonkers. Thanks for the comment (keep em coming) and glad to hear that you enjoyed the post. Micah, been chewing on your question a bit more since I posted my original comment. I don't think this is anything particular to wine. I think it is something more general about our society. It seems that radically changing from one thing to do another is always thought of as a little bonkers. It's a shame because I do think that this is one of the things that dissuades people from following their passions - there is not necessarily a lot of support for it from friends, family, society. I think it's also the reason why people make such a big deal out of it when people do. Partly because it's so unusual, and partly because it is probably somewhat threatening (to some, inspirational to others) to people who are doing something they don't really enjoy because that is what is expected of them or because the money is good. Life is too short though in my opinion do be doing things you're not passionate about. Thanks again for the comment. Yes, I agree..life is too short, and as I slept on your comment..I was thinking that you can get rich on doing anything in life if that is your end goal. Richness can also be quality of life where you are your own boss and/or can make something with your hands and be proud of. Look forward to your next post(s)...especially the round up..that is your signature!